Coming soon: the new SKOT shirts. Before we’ll show the first pictures, we can spoil some nice details about the shirts. SKOT started with 12 different shirts, in the Fun collection and the Serious collection. Unfortunately, a lot of sizes are sold out already, especially from the smaller sizes. I guess I didn’t expect that the demand for quality sustainable shirts would be that high! Therefore part of the current collection will be replenished. The collection will be increased as well. Some of them will resemble shirts we currently have, such as the Serious Spot or the Serious White. This is because the old fabrics were no longer available and we needed to use a new fabric. Other shirts will be completely new! There will be two shirts with a green pattern. And shirts with some darker colors, such as black and navy blue. All in all, six shirts from the current collection will be replenished, and ten new shirts will be added. This means you’ll have more and more choices if you want to wear sustainable quality shirts! 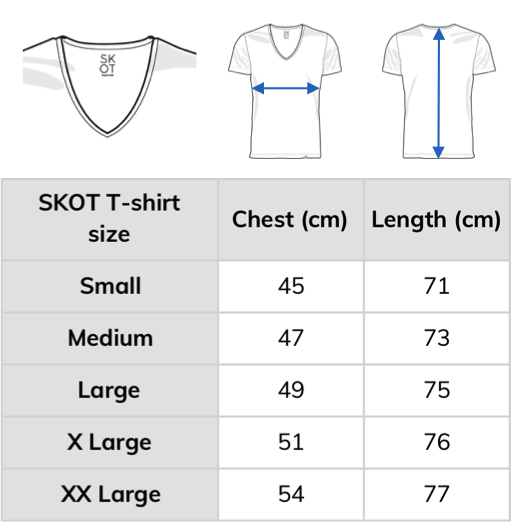 The design of the SKOT shirts remains almost the same. It’s a slim fit shirt, with a slightly longer sleeve length than standard. The main adjustment we made is that the new shirts will be a bit longer. Most people will wear the shirt in the pants, and they can use just a little bit more space over there. 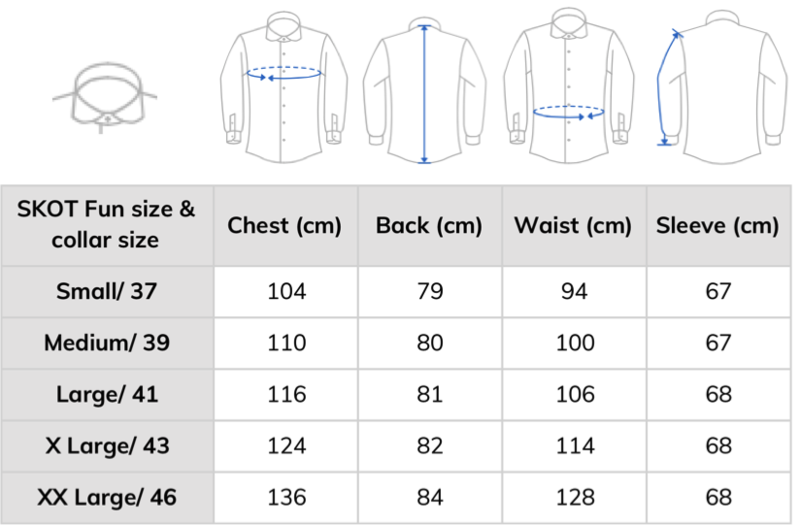 The Fun shirts are getting 3 to 4 centimeters longer, and the Serious shirts 4 to 5 centimeters. In terms of fit, two small adjustments have been made. One is a slight increase of the cross chest width, which makes the creep of the shirt less. The size of the upper arm has been slightly decreased. Thanks to everyone for the reviews of the shirts, with your help we can continue to improve the design. Are you a fan of having a shirt with a breast pocket? Then there’s good news! In the new collection the White Fun shirt will be enriched with a modern breast pocket. 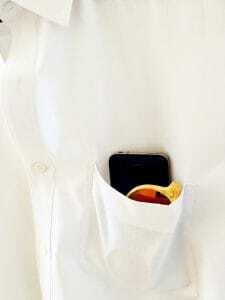 So anyone who likes to store his glasses or phone in his shirt: a sustainable solution will soon be available. The last adjustment for now: the Serious White will be made with a different weave. Instead of a ’twill’ the new shirts will have an ‘oxford’ weave. This ensures that the shirt will feel a bit thicker, and will be less translucent as well. All in all these are developments that make the most sustainable shirt on earth only better. More quality and higher comfort. It’s a journey in which we want to improve time and time again. The goal is 100% sustainable fashion! It takes way longer than I like before the new shirts will arrive. But over the past few months it became clear again that the production of clothing has a long and complicated process. 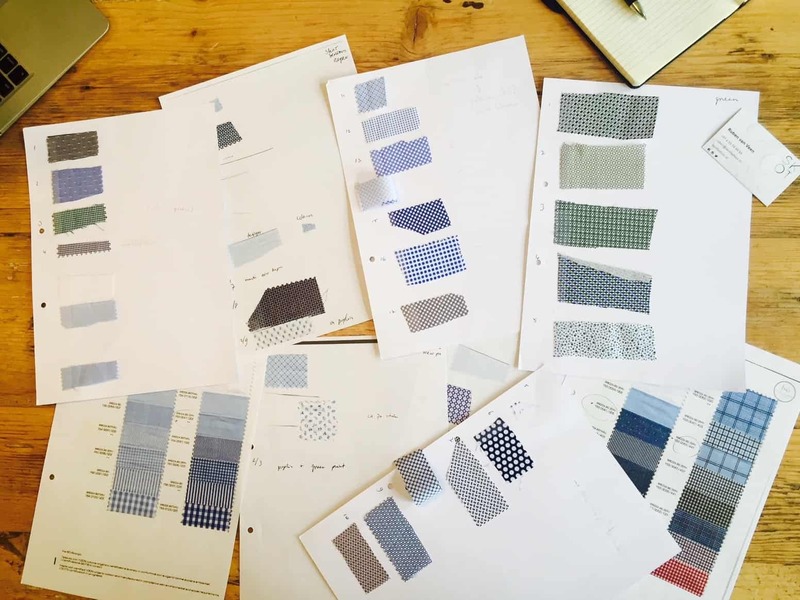 It’s normal for brands to plan a year ahead with their collection. Naively, I was thinking about three months. In addition, I only want to use organic cotton, of which there is little supply. So the fabric had to be produced first, instead of using stock or fabrics of a current collection. It made the waiting time uncomfortable, but the greater the joy will be when the new collection will be available in the webshop in March! In the coming weeks we’ll give some more information about the new shirts, and soon the first photo’s will appear as well. Keep an eye on our website and social media!